Let Us Upgrade Your Break Room! Check Out Our Office Coffee Services! See The Convenience of Mico Markets! Call Us Today for All Your Break Room needs! We're Here For All Your Vending Service Needs! 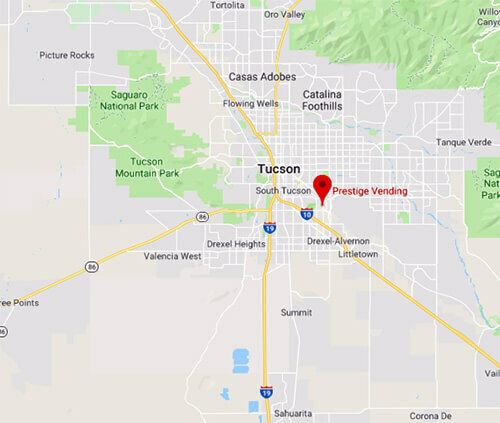 For more than 30 years, Prestige Vending & Coffee has provided Tucson, AZ and the surrounding areas with coffee and vending machines. We give you the necessary equipment and keep you fully stocked with delicious coffee, healthy snacks and everything in between! From your cafeteria to the break room, we’re your all-in-one provider of self-serve healthy snacking solutions. We’re a full-service food company and aim to be your vending partner. Offering healthy snacks and accessible food in your facilities is a great perk for everyone within them. Whether it’s a couple of vending machines or an entire self-serve micro market, Prestige Vending & Coffee will help you tailor your vending options around the needs of the people you’re offering them to. Our food service options span every level—from our Prestige Kitchen micro markets to basic office coffee in Tucson, AZ. We’ll be glad to work with you to determine what your needs are, then tailor vending and self-serve options around them. We even offer flexible accommodations, such as stocking diet-specific foods or health-focused options. Plus, we never tie you into a rollover contract! Our contract-free vending is all about helping you provide affordable food and drink, not locking you into a contract. We pride ourselves in offering our vending customers healthy food choices, a great layout and personal serving sizes, to ensure they’re totally satisfied. Our vending options include some of the biggest, most-loved brands, including Coca Cola, Pepsi, Frito Lay, Heinz, Starbucks, Seattle’s Best and many more! Our state-of-the-art vending and checkout technologies make it easy for your customers to get the food items they want, fast. As a locally-owned and -operated business, we’re a part of the Beacon Group, Tucson Chamber of Commerce and Tucson Hispanic Chamber. Whether you partner with us for vending machines, micro markets or office coffee service in Tucson, AZ, rest assured you’re always getting the best. The best brands. The best service. The best plan for you. We’ll make sure adding self-serve food and drink options to your facilities is one of the best decisions you make! And, with Prestige Vending & Coffee taking care of the stocking, maintenance and technology behind our vending options, there’s nothing you have to do outside of telling us what your needs are. Contact us today and let us bring the ideal food or coffee solution to you. Want to provide the best in healthy snacks and self-serve convenience to your staff, students or visitors? Let us set you up with brand-name food and beverages, powered by top-tier tech! We’re your all-in-one vending service partner. From providing the equipment, to restocking it and even troubleshooting, we do it all.